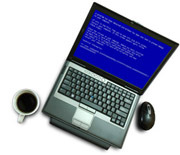 STORMComponents are experts in repairing laptops, netbooks and other portable devices. Laptops, like any other computer, can be infected with viruses, develop instability or suffer from poor performance as they age, but laptop computers can also develop problems specific to their design. Issues such as batteries not holding charge, ports failing to work, cracked screens, faulty touchpads, sticky keys and damaged keyboards are all quite common with laptops, and because of their compact size; they are prone to overheating, graphical issues and system instability as well. If your laptop is damaged or isn't behaving, ring us today. Really fast and helpful service. Got sorted on the day my problem arrived. And was. Fixed within no time. Would recommend. I've just had a new drive installed by Storm and the service has been excellent.